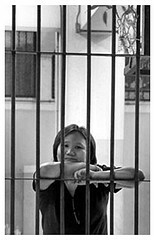 Update: Jiew's trial will resume on February 14, 2012. Chiranuch Premchaiporn, more commonly known by her pseudonym, “Jiew,” is the director of one of Thailand’s most popular alternative news sites, Prachatai. EFF has been following Jiew’s work--and her commitment to free expression--for quite some time. In October 2010, following a conference on Internet freedom, Jiew was arrested upon re-entering Thailand. EFF conducted an interview with her shortly afterward. Jiew was charged under the intermediary liability section of Thailand’s 2007 Computer Crime Act, as well as for the crime of “Lèse Majesté,” which has often been used in Thailand to enforce censorship. For the two crimes, Jiew faces a combined sentence of 82 years. In February, at the start of her trial, we expressed our grave concerns; Now, after a recess of nearly eight months, Jiew’s trial resumed on September 1 and remains ongoing, with September 20 marking the first day of the defense. Each day of the trial has attracted international observers from both foreign governments and NGOs, including Freedom Against Censorship in Thailand (FACT), which has blogged several days of the trial. What is most alarming about this case is that, under the Computer Crime Act, Jiew--as the director of Prachatai--is being held responsible for comments left by users on the site. Whereas in the United States, site hosts are largely protected under Section 230 of the Communications Decency Act, in Thailand (and in numerous other countries), there are no such protections. Therefore, any content host can be held liable for comments left by others; this often has the effect of self-censorship, in that content hosts will moderate or turn off comments to avoid potential liability. The Asia Internet Coalition believes that responsible intermediaries should be protected from prosecution over the actions of users and that clear notice and takedown policies must be in place. EFF agrees with the Asia Internet Coalition. Jiew is facing a decades in prison for the act of being an editor and, if convicted, her case could set a precedent that could have chilling effects on both innovation and free expression in Thailand. Even though this award gives me support, and encourages me to face the threats on the rights & freedoms of expression--which makes me grateful--at the same time it also makes me feel sad. We cannot deny that the significance of me being the first Thai who receives this award. It means that this is an indicator that the freedom of expression in this country has drastically declined since the 19 September 2006 coup.